• Taking eye drops that dilate the pupil to prevent muscle spasms in the iris and ciliary body (see diagram). • Taking eye drops containing steroids, such as prednisone, to reduce inflammation. 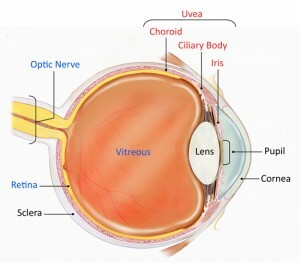 This guide provides information about uveitis. It answers questions about its causes and symptoms, and discusses diagnosis and types of treatment. It was adapted from the following sources: Durrani OM, Meads CA, Murray PI: Uveitis: A Potentially Blinding Disease, Ophthalmologica 218: 223-236, 2004. Jabs DA, Nussenblatt RB, Rosenbaum JT, and Standardization of Uveitis Nomenclature (SUN) Working Group: Standardization of Uveitis Nomenclature for Reporting Clinical Data. Results of the First International Workshop, Am J Ophthalmology 140(3): 509-16, 2005. MayoClinic Uveitis Webpage MedlinePlus Uveitis Webpage Nussenblatt RB & Whitcup SM: Uveitis: Fundamentals and Clinical Practice, Philadelphia, 2010, 4th edition Mosby (ISBN 0-323-02237). The Ocular Immunology and Uveitis Foundation: A Guide to Ocular Inflammatory Disease webpage. Power WJ: Introduction to Uveitis. In Albert DM & Jakobiec FA, editors: Principles and Practice of Ophthalmology, Philadephia, 2000, W.B. Saunders. Pubmed Health Uveitis Webpage Sheppard JD & Nozik RA: Practical Diagnostic Approach to Uveitis. In Duane TD & Jaeger EA, editors: Duane’s Clinical Ophthalmology, Philadephia, 1991, Lippincott. Wakefield D & Chang JH: Epidemiology of Uveitis, Int Ophthalmol Clin 45(2):1-13, 2005.